The Childs Farm Bubble Bath contains organic tangerine oil for "soothing bath time bubbles". It claims to moisturise the skin and help to relax before bedtime. To use, squeeze a "generous slug" (I love that direction, "generous slug!") to warm, running water. I personally find that it doesn't lather up a huge amount, but you don't need excess for a baby bath so I actually think that it's the right amount. It has a beautiful tangerine scent that is rather relaxing. It helps to send my little miss into the land of nod post-bath, and with my little man it switches the dial down from total chaos-time to chill out-time which is great. Like the other Childs Farm products that we've tried, it doesn't irritate my son's eczema, leaving his skin smooth and happy instead. 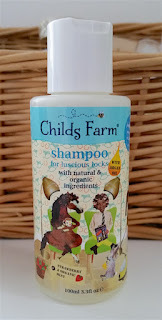 The Childs Farm Shampoo is suitable for all hair types. It contains argan oil and has a scent of strawberry and mint (I love it!). Only a teeny tiny amount is needed as it lathers up so well, even though the bottle states to use a large dollop. 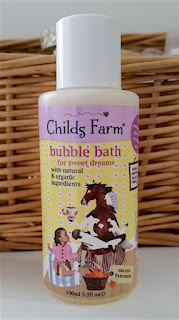 It also rinses easily so there is less hassle trying to get the product out of impatient kids hair (whew!). The hair is left feeling soft and clean and that scent of strawberry and mint lasts on throughout the day. Like the shampoo, the Childs Farm Conditioner is also suitable for all hair types and smells of strawberry and mint. For me, this is definitely the highlight of the trio. It leaves the hair feeling so silky smooth and makes it easy to detangle. Less knots, less crying! Rinsing is also quick and simple and again, just like the shampoo, that beautiful scent lingers on throughout the day. Overall, I'm a big fan of this little Top-to-Toe trio. None of them are irritating my son's eczema and they are suitable for both of my little ones with different skincare needs. As with the other Childs Farm products that we have tried, you can definitely feel the thought and love that went into making them. They really keep the kids in mind and it shows. 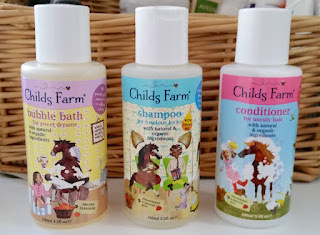 This is a great little starter kit if you're interested in trying out Childs Farm, but it is also fab as a present for friends or family who have recently had or are soon to have children as well as for travelling. You can purchase the Childs Farm Top-to-Toe Cleaning Kit for £8.99 from Childs Farm or you can purchase the items individually from Boots. 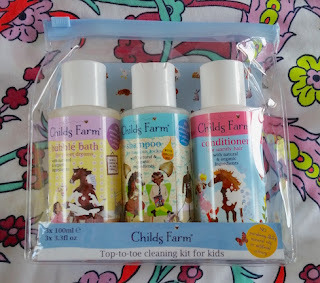 What are your thoughts on the Childs Farm Top-to-Toe Cleaning Kit? What are your favourite Childs Farm products? In changing positions of liquid and air, pumps are considered to be the most essential equipment; especially in the industrial phraseology, these pumps play a significant part. The high pressure pumps are distinctively designed and manufactured for industrial and commercial purposes.